Europe’s top custom festival has attracted strong interest from the mainstream manufacturers this year, with Harley-Davidson choosing the Biarritz venue to showcase its Battle Of The Kings competition. 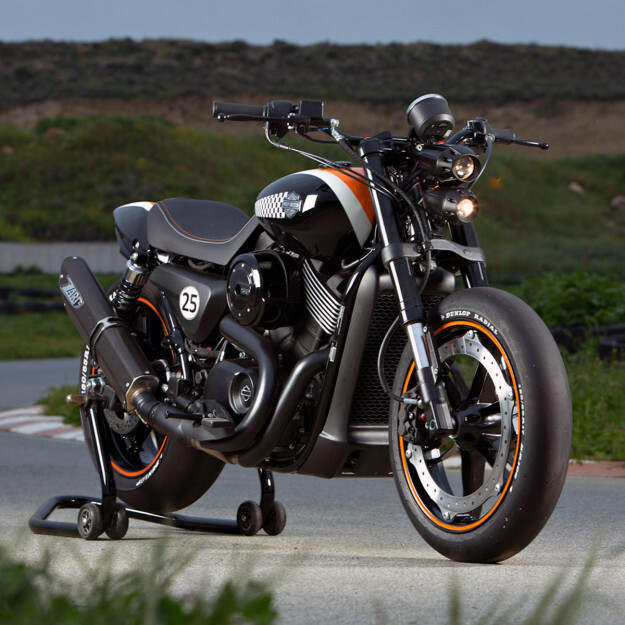 Public voting had already selected the five finalists—Street 750s built by Harley dealers working against strict limits on expenditure and time. To help pick the ultimate winner, Bike EXIF joined judges Ray Drea (H-D Chief Stylist), Moto Heroes editor Fabrice Roux, Craftrad editor Hermann Köpf and Jérôme Allé of Southsiders MC. Here’s the lowdown on the bike—plus two of the other machines that also took our fancy. Winner: SHDB 04, Harley-Davidson Prague (top and above) The Czech Republic walked away with top honors, enhancing the Street 750 with classic café racer styling. The metalwork is beautifully hand-beaten and the proportions just perfect. Inspiration came from two unusually sleek bikes: the Lotus C-01, and the custom Softail ‘Nascafe Racer’ built by Shaw Speed for Bell + Ross. Technical changes include a new rear frame and a Vance & Hines Fuelpak FP3 fuel management system—which optimizes and auto-tunes engine performance to suit the stubby custom exhaust. Other mods include rearsets, new lighting front and back, and a bobbed fender. Even the instruments have gone, replaced by a mobile phone interface. 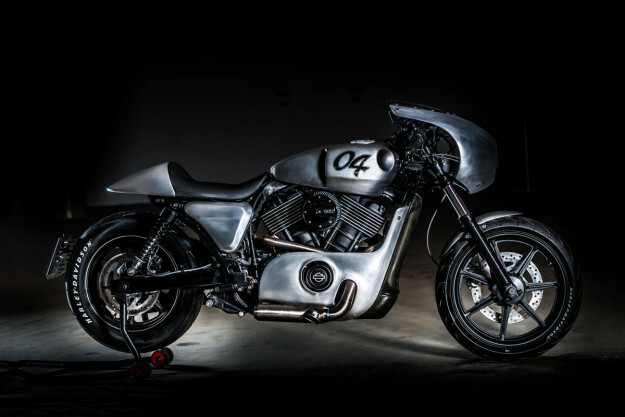 Runner-Up: Harley-Davidson Ostfold (above) Lead builder Svein Erik Simensen directed a team of young mechanics for the Norwegian entry, and this low ‘street racer’ looks exceptionally fresh in the metal. 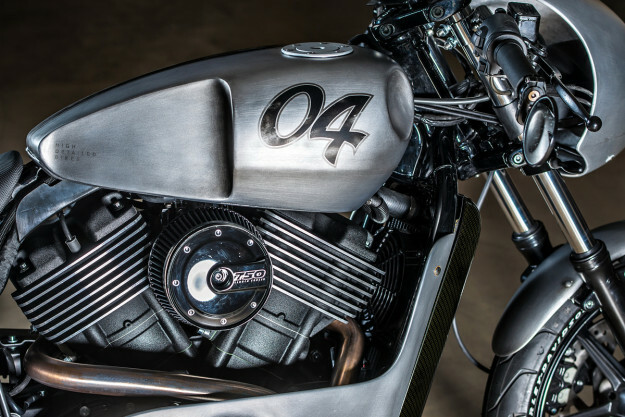 The bike has been dropped a little using a Sportster suspension kit—but the most radical change is the extremely elegant rear end, with a slimline seat and kicked-up fender completely transforming the look and visual stance of the bike. Subtle changes to the headlight and instrument positioning and stark black-and-orange paint give the Street a sharper edge, with compact blinkers reducing the visual clutter still further. 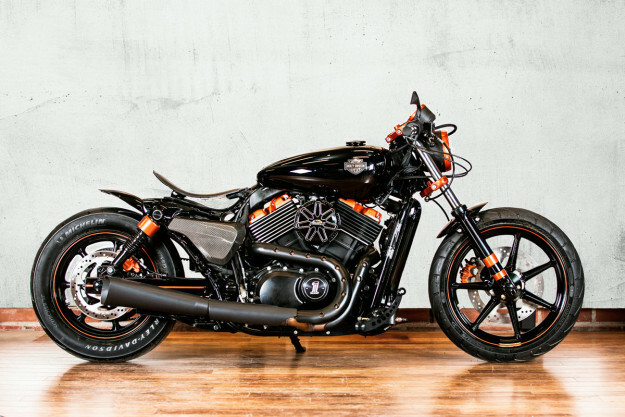 Runner-Up: Harley-Davidson Centre Cyprus Lead builder Andreas went for an aggressive, racer-meets-streetfighter approach for ‘Revolution X’. His crew has given the Street 750 a more muscular look, with new triples and beefier forks up front, and a short cowl at the back. The rims are aluminum race items, and the front brake system has been upgraded too. Twin headlights and streetfighter bars complete the look. For custom Street 750 inspiration, check our previous coverage of entries from Belgium and Austria.